Another day, another banana bread recipe. This time I’m sharing one which I’d count as one of my two favorite recipes. 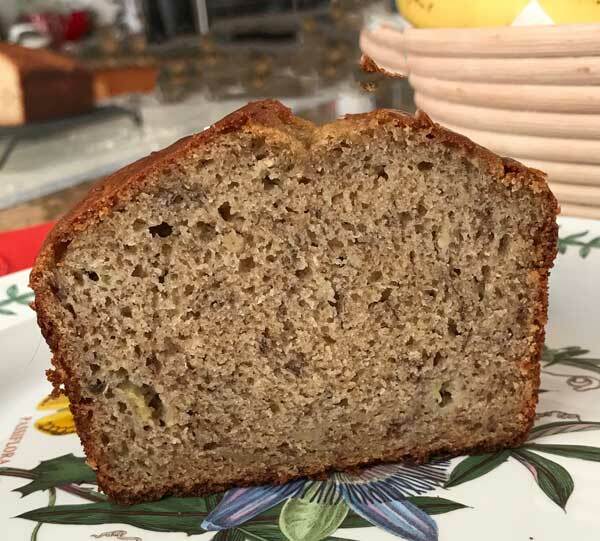 The two favorites are Best Ever Banana Bread (which you can read about in another post) and this High Rising Banana Bread The Best Ever Banana Bread is sweeter, heavier and more cake-like, while the High Rising Bread is still sweet, but more like a quick bread with a high domed top. This bread is always a success even when little changes are made. For instance, I don’t always have sour cream on hand so I sometimes use full fat yogurt. For the flour, I typically use a mixture of all-purpose and wheat, but just all-purpose or bread flour works too. Lately I’ve been enjoying the firmness of the loaves made with bread flour. The latest little twist was adding a cream cheese swirl/ribbon. This recipe actually works really well with a cream cheese ribbon and doesn’t sink as much, so I’ve included the cream cheese option in the notes. If you try this version, let me know! Mash the bananas with a fork, leaving them a little lumpy. Also, weigh the banana if possible so you’re using exactly 13 oz. Stir the melted butter/oil in at the end. Maybe it’s a coincidence, but when I add the melted fat last, banana breads and even pound cakes seem to rise higher. Just don’t forget to add it! If you have some whole wheat flour, incorporate some whole wheat flour in with the all-purpose flour (a tip I learned from The Silver Palate). It absorbs more liquid resulting in a somewhat lighter, higher rising batter. 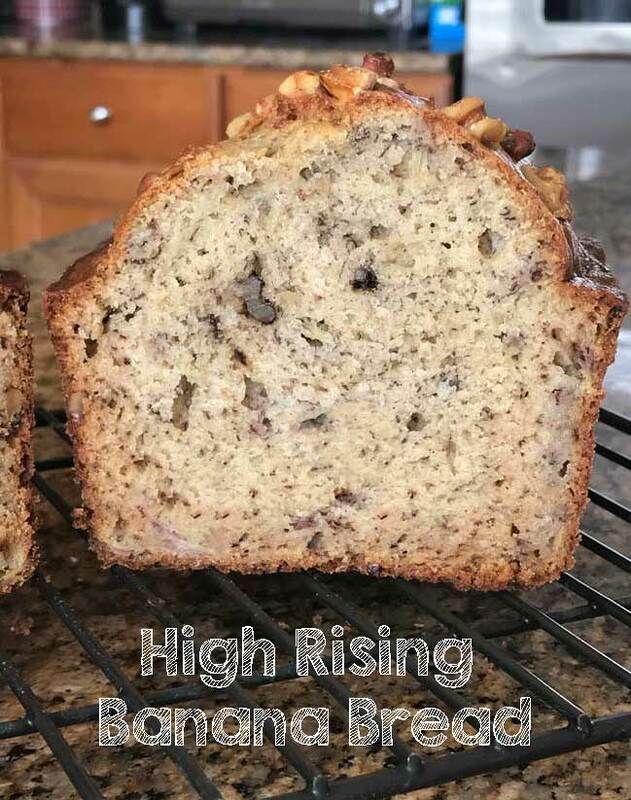 High Rising Banana Bread is a not-too-sweet, firm, banana bread that always rises high. Preheat the oven to 350 degrees F. Grease the bottom and short sides of an 8 ½ by 4 ½ or a 9x5 inch loaf pan and line with a strip of parchment. Grease again, then dust with flour. Whisk together both of the flours, sugar, baking soda, salt, and salt. When you whisk, do it very thoroughly so that all dry ingredients are evenly distributed. In a large bowl, mash the bananas with a fork, then stir in the sour cream, eggs, and vanilla. With a heavy duty scraper, stir the dry ingredients into the banana mixture. Pour the melted butter and oil over the batter and stir with a heavy scraper until well blended – do not overbeat, just gently fold. Transfer batter to the pan and spread evenly. Sprinkle nuts over the top. Let cool for about half an hour, then loosen from pan. Let cool for another half hour, then remove from pan and let cool completely. For a cream cheese swirl version, beat together 3 oz cream cheese, softened (84 grams), 5 teaspoons sugar, 2 tablespoons lightly beaten egg and 1/2 teaspoon vanilla extract. Put all but about 2 tablespoons of banana bread batter in the pan, then drop spoonfuls of cream cheese mixture over the top. Drop remaining spoonfuls of banana flavored batter over the cream cheese and drag a knife through gently to make a marbled pattern. Bake for 60-70 minutes. Sue, I ran out of whole wheat flour and have been making it with all-purpose or bread flour. I really love this recipe, though it’s not as sweet as the Best Ever. This one holds up really well to the cream cheese ribbon (doesn’t sink as much). I’ve probably made this bread 10 times in the past 3 months. I’ve never put whole wheat flour in banana bread. It’s interesting that it adds to the rise. Jerry, that would be peeled. It’s usually about 3 large bananas. Is weight of bananas with or without skin? Mmmm! Love how high it is!